In order to obtain electrospun fibers from a solution, suspension or emulsion, four principal components are required. The solution to be spun is typically delivered at a constant flow rate by means of a syringe pump or pressurized liquid feeding system. While for syringe pumps, the solution is typically contained in a glass or plastic syringe, pressurized liquid feeding systems can contain the solution in a reservoir and deliver it in a semi-continuous approach. 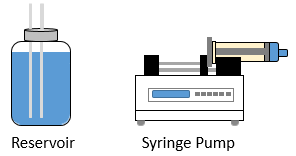 Commonly used syringe pump systems can deliver up to 140 mL of solution per batch at rates ranging from 0.1 µL/h to 6,000 mL/h. Meanwhile, pressurized liquid feeding system can contain multiple volumes that range from a few to thousands of milliliters of solution and can be rendered in a semi-continuous mode. Spinning head emitters are employed in needle-based electrospinning in which multiple configurations can be implemented. These capillary needles can be configured as single, co-axial and multi-axial phase emitters. In single phase only one liquid is flowing through the nozzle to form fibers with a single structure. In co-axial mode, fibers can be developed as core-shell structures, especially when encapsulation is desired, or in a split structure known as Janus fibers. Multi-axial phase is a third way to create fibers through the electrospinning technique were more than two solutions can be spun at a time. Electrospun fibers using different types of emitters. Typical electrospinning heads consist of a single capillary needle. In order to increase electrospun fiber throughput the scientific community has implemented multiple parallel emitters in the spinning head. All emitters are fed from the same solution feed, increasing production rates and fiber yield. Co-axial parallel multi-emitter electrospinning head with 96 emitters. An additional feature of the emitters during the electrospinning process include the ability to control end product fiber diameter. Shortly, fiber diameter is directly proportional to the emitter inner diameter. Thus, while larger fiber diameters can be obtained with larger inner diameters, smaller fibers can be achieved with smaller inner diameters. A high voltage power supply with adjustable voltage is used to start the spinning process by polarizing the emitter. Researchers have used voltages up to +50 kV when creating electrospun fibers in the nano and micro scale. To collect the electrospun fibers, a collector is typically grounded to attract them into a specific area. While grounding a collector typically works well for small thicknesses, fibers can be collected into undesirably grounded locations. One way to avoid this from happening, and accurately improve fiber collection, is by applying a negative voltage into the collector. This will maximize the emitter-collector electrical voltage drop improving fiber yield during the electrospinning process. Once solidified during the spinning process, electrospun fibers can be collected into a wide variety of collectors, mainly consisting of stationary and rotating platforms. These collectors will have a significant impact in the final design of the electrospun sample. Stationary collectors are commonly flat plates to collect random fibers where the extent of the area can be tailored to a desired range. Rotating collectors include disks, mandrels and drums, all which can have a wide variety of desired diameters. Mandrels can collect fibers in random orientation due to its typically short diameter. Meanwhile, disks and drums are able to collect aligned structures if diameter/length ratio and rotating speed are high enough to allow high linear speeds that will allow stretching of the fibers during collection. Fluidnatek LE-10: Benchtop laboratory tool for proof-of- concept and feasibility studies of new materials and formulations. Fluidnatek LE-50: Compact laboratory benchtop machine as powerful as an advanced research station. Fluidnatek LE-100: Advanced R&D tool with a large experimental chamber and wide range of optional features. Fluidnatek LE-500: Pilot-line production tool that provides all of the capability needed to develop a product from initial concept to pilot-scale manufacture.